Regarding the attacks on a labour centre in Mainland China, the Shenzhen Longgang court is handling the case. However, the court openly violates the national law by refusing Hong Kong citizens and other foreign people to observe the public hearing. What is more, the court has been handling the case with much unfair, unjust and abnormal procedure. Concerned groups gathered at the the Office of the Hong Kong SAR of the Central People’s Government to hand in a letter and demand for a meeting with the Central People’s Government Officials. However, the Central People’s Government Officials rejected to receive the letter and has no response to the groups' demand for a meeting. 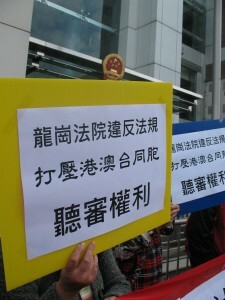 Above photo: Protesters: "Shenzhen Longgang Court Violates the National Law. Hong Kong & Macau citizens and foreigners' Rights to observe the court public hearing REJECTED!" We represent a group of fellow citizens from Hong Kong and foreign nationals. We’re seriously concerned with the violent knifing of Huang Qingnan, the registered licensee and employee of a labor group in Shenzhen at the end of 2007. The incident is currently being tried by the Shenzhen Longgang District People’s Court. When some of us went to the courts to observe the public trial, we were told that “under the direction of those responsible,” the courts were refusing entry to Hong Kong, Taiwanese and foreign citizens, though this is against the law. We feel outraged, and we believe the court’s handling of this trial violates the principles of a fair and open judicial system. We, the undersigned, protest and insist that the Shenzhen and Central governments ensure the proper handling of this incident to protect Chinese citizens’ safety and the nation’s dignity. Though five suspects were arrested in Jan a yr ago, the court held trial for the first time only on Dec 24th. On that day, the courts arranged a small courtroom that could fit 16 people. This could in no way meet the requirements of a public trial, and without grounds, the courts refused entry to approximately 50 workers and representatives of Chinese groups, including 10 representatives from our own Hong Kong, who went to observe the trial. In the end, after the plaintiff, Huang Qingnan, and his lawyer discussed the issue with the courts, there was no option but to postpone the trial. The courts agreed to ensure they would provide a courtroom with a capacity for a minimum of 50 people for the trial. How is it sensible that the courts claim “Our instruction from superiors is that Hong Kong, Macau and Taiwanese citizens will not be permitted to enter. Only Chinese citizens will be permitted entry.”? Huang Qingnan received notice of the second trial date at 17:00 on Jan 13th, three days before the new trial. 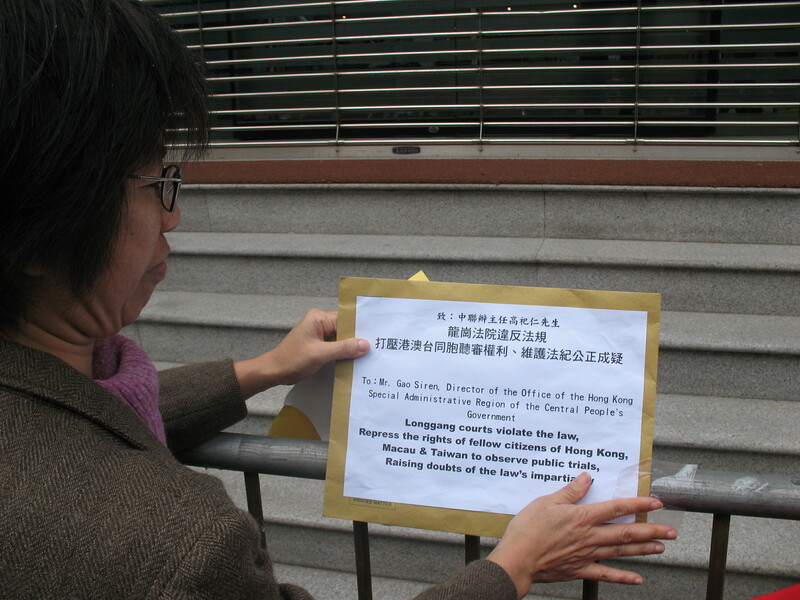 On Jan 16th, more than 10 Hong Kong, Taiwanese and foreign representatives from our group went to the courts. The courts had only arranged a courtroom with a capacity for 30 people, seriously going against the court’s previous agreement with Huang Qingnan. Over 60 people including Chinese workers, both domestic and foreign group representatives and journalists were once again refused entry to observe the trial. The court’s representatives told us, “Foreign nationals are not permitted to enter”, and “Our instruction from superiors is that Hong Kong, Macau and Taiwanese citizens will not be permitted to enter. Only Chinese citizens will be permitted entry.” And still, the courts only offered permits for 10 people from the plaintiff’s side to observe the trial. We, more than 10 Hong Kong and Taiwanese fellow citizens, feel incensed at the court’s statements. Is it true that Hong Kong citizens do not count as Chinese citizens?! To the contrary, according to the rules on the participation of persons from outside the territory, the Highest People’s Court’s 1999 Rules on strict implementing of a system of open trials does not prohibit Hong Kong, Taiwanese or foreign nationals from entering the courts to observe public trials. The reckless decision of the Longgang District People’s Court is only “the instruction of superiors” and openly challenges the rules of the Highest People’s Court. This is the substitution of rule of law by rule of men. It reflects a loss of national unity and the spirit of a judicial system! The court’s arrangements openly violate national laws and the principle of fair and open trials! Making light of this incident is a serious travesty! The court went against national law and the principle of public trials in three ways. First, they refused entry to Hong Kong, Taiwanese and foreign citizens, as well as the majority of mainland Chinese citizens who wished to observe the trial. The court likewise tricked the plaintiff, explicitly agreeing with him to arrange for a courtroom with a capacity for 50 people and then providing a courtroom that only sits 30 people. What is more, a written notice to the plaintiff suggested the trial would be held in courtroom #13. Courtroom #13 is big enough for 300 people. Yet on the day of the trial, the court switched the numbers on the courtroom doors, temporarily transforming a smaller courtroom with a capacity of 30 people into courtroom “#13”. People entering the courts to observe a trial must first pass their belongings through x ray inspection. In addition, before entering the courtroom, the Longgang court again referred to “instructions from superiors” and required the plaintiff (both Huang Qingnan and his lawyer, Li Fangping) to undergo a bodily inspection. Counsel Li Fangping believes this is a violation of the 6th clause of Regulations on security inspections by the judicial police of the People’s Courts issued by the Highest People’s Court. Lawyers represent a key part of the judicial system, and are governed by a code of professional ethics. Li Fang Ping felt that a bodily inspection was a humiliation, and therefore resolutely refused the inspection. The court therefore prevented him from entering the courtroom. The trial was originally scheduled to begin at 9:30. But after going through multiple inappropriate procedures, the plaintiff arrived in the courtroom only at 10:00. On entering the courtroom, the plaintiff discovered the trial commenced before his entry. This is a serious violation of the plaintiff’s rights. 3) If a defendant is someone who accepts a protection fee for the use of force, the incident should come under the review of laws on gangster violence and malicious deeds. This adds severity to the possible outcomes of the trial. This issue is vital to the interconnected criminal and civil trials against the five defendants. However, the court processed the trial in a little over 3 hours through its “quick trial” process. This is very different from previous statements given by the court that “the trial will possibly need more than 1 day”. Add to that the short notice given to the plaintiff, and it is enough for some to suspect that someone is trying to influence the trial and use the “quick trial” process to reduce public attention on the incident. In Dec 2008, the Shenzhen City Judicial Dept. required Huang Qingnan to renew the assessment of his injury. They issued the opinion, “Huang Qingnan’s injuries do not constitute a 6th degree of disability. It is therefore impossible to correctly determine whether his injuries constitute a serious injury.” This opinion overturned the Shenzhen City Inspection Office and Police Dept.’s conclusion at the beginning of the yr that Huang’s injuries were “a 6th degree disability and serious injury”. Plantiff’s counsel, Li Fang Ping, points out that the Expert Assessment Committee that issued the Dec opinion of the Shenzhen City Judicial Dept. only serves an advisory role. Their opinion has no standing in the eyes of the law, and does not overturn the original, documented injury assessment of organizations approved to conduct assessments. 4. Justly implement national laws to protect workers and NGO staff’s safety. 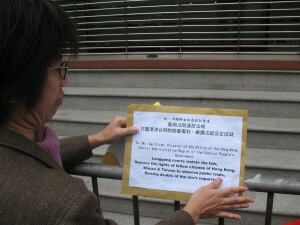 Above photo: On 20 Jan 2009, a group of concerned groups gathered at the Office of Hong Kong SAR of the Central People’s Government. 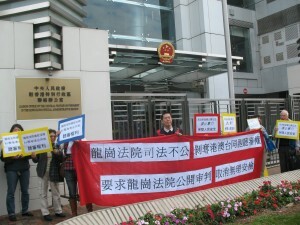 Above photo: The Central People’s Government Officials rejected to receive the letter. The group has no choice but to stick the letter on the gate set up by the Hong Kong Police.